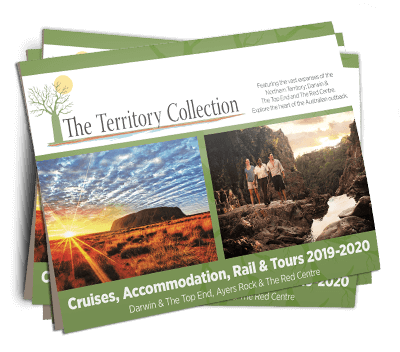 The Territory Collection is an exclusive blend of Territory products featuring diverse accommodation choices, 4WD & special interest tours, rail packages, fishing safaris & self-drive itineraries. We have sourced and offer the finest and most reputable companies operating in the Northern Territory covering both Darwin & the Top End and The Red Centre. We pride ourselves in offering an extensive range of options for all types of travellers to the region. We offer a wide range of accommodation including quality hotels and unique lodges to cater for couples, families and groups looking to experience the Territory in the finest style possible. Touring ranges from group departures, to private tours and can vary in length enabling you to travel in the most suitable style for your budget. Self-drive itineraries allow the flexibility to travel at your own pace and can be tailored to your individual needs. The Ghan rail packages will appeal to those travellers looking to experience a combination of rail, accommodation and touring. These packages can be tailored to suit your travelling requirements. We invite you to visit the ‘Heart of the Australian Outback’.